The CCP is strengthening the crackdown on religious belief in schools by using propaganda videos, online petitions, and ideological indoctrination of students and staff. 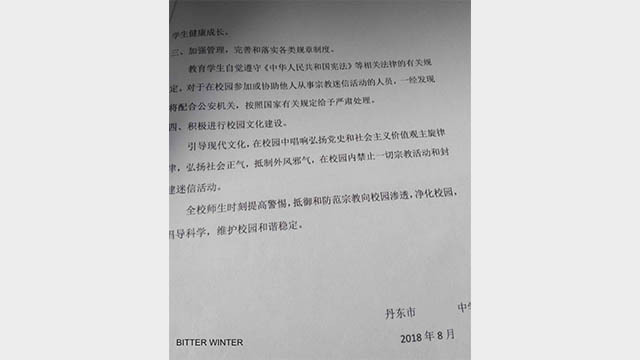 The administration of a middle school in Liaoning’s Dandong city recently issued a document banning all religious activities in the school. On September 21, all students and the teaching staff were gathered together, and the text of Approaches for Resisting and Preventing the Infiltration of Religion on School Campuses was read aloud. To deal with the “symptoms and causes of religious infiltration,” the document strictly prohibits teachers and students from engaging in any religious activities; if transgressions were discovered, the school would administer severe punishment in co-operation with public security institutions. The document also demands to strengthen the education of Marxism and atheism, aiming to replace religion with belief in communism. At the end of last year, authorities launched a nationwide online petition against religious faith. 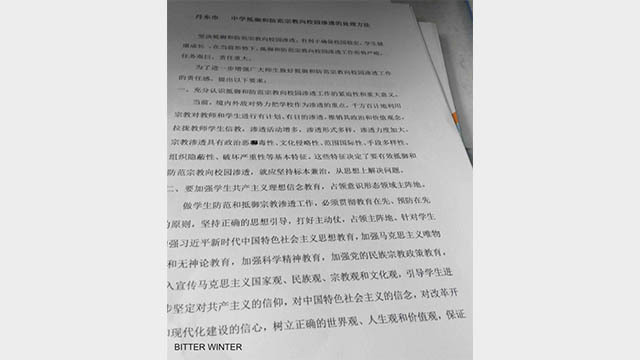 As per accounts from Liaoning’s Yingkou city, students and their parents in one of the schools were requested to sign the petition on the social media platform WeChat and send screenshots with their signatures to a group account on the platform as proof. The school administration demanded that at least 80 percent of students and their parents in every class signed the petition.